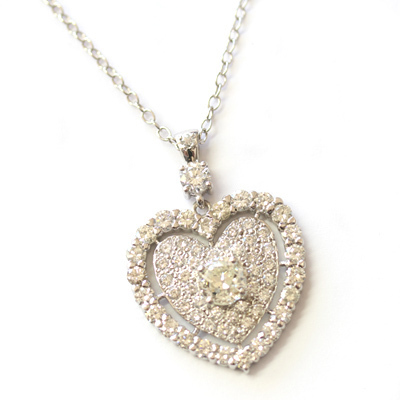 9ct White Gold Fully Diamond Set Heart Pendant — Form Bespoke Jewellers Ltd.
A bold and beautiful fully diamond set heart pendant cast in white gold. 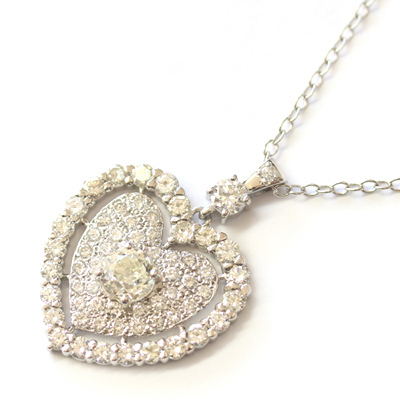 This stunning heart pendant boasts diamonds provided by the customer who was looking to have them re-set into a bespoke jewellery piece. At the centre of the heart is a large round brilliant cut diamond which has been claw set by hand. 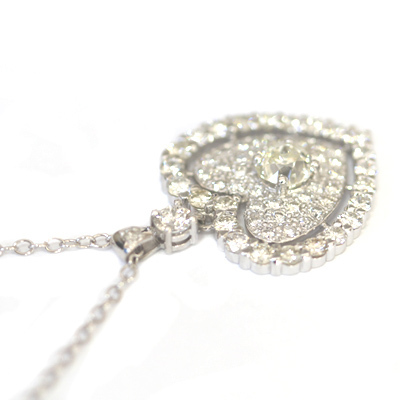 Surrounding it, the slightly concave heart has been fully set with smaller round brilliant cut diamonds. Then, for even more sparkle, a halo of slightly larger diamonds frame the internal heart and another larger diamond sits between the bale and the halo. There is even a diamond on the bale. There can be no denying that this pendant is a super sparkling showstopper! The heart sits on a white gold necklace that is beautifully proportional to both hold the pendant and show it off to its full potential. A lovely re-working of the customers diamonds.